This issue occurs when I wear 3 different pairs of earbuds, and also with my bluetooth car stereo. The audio path will intermittently switch from the bluetooth device over to the phone speakers. See attached image. 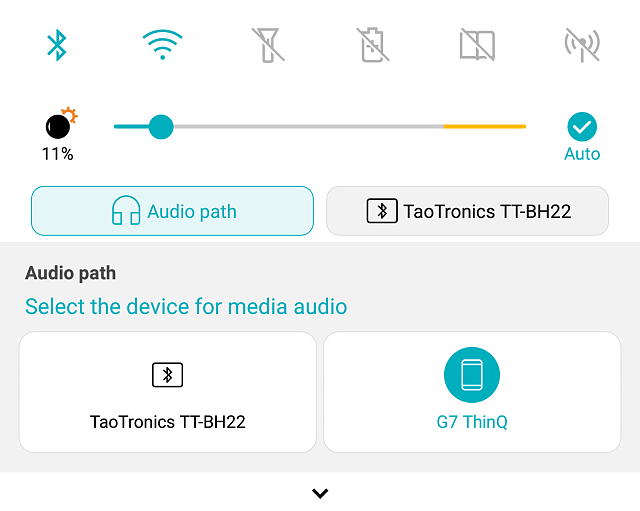 In order to switch back, I have to manually pull-down the top menu, click "Audio path", then click the bluetooth device. Is anyone else having this issue? Is there a fix? I'm having the same issue with my Anker bluetooth earbuds. The audio path will randomly switch, and the music won't even pause or anything. why does the wifi in my phone keep disconnecting? My phone has a virus a it won't play in aux mode in my truck what can I do?? On My Google Pixel 2XL I am trying to send a group text but as individual emails. How can I sync my "Me" picture contact with Gmail account?